We don't have a full list of everyone who served at any particular time. Some of our sources may also be very brief and simply state a soldiers name, rank and number - some records state the battalion - others do not. The list below includes the material we do hold. * Marked items are available as a museum publication from the museum shop or by postal sales. Partial list of King's Own soldiers serving in the interwar years. Roll of Honour of Soldiers of the King's Own who died between the end of the First World War and 1939. Roll of Honour of those soldiers of the regiment who died between the end of the Second World War and 1959. In addition the museum also holds records relating to men who served with other regiments. Most soldiers from the Lancaster area who served in the Second World War in the early period of the war (up to about 1941) based upon the Mayor's Comforts Fund records. The museum holds copies of regimental and battalion histories, as well as some war diaries for both the First and Second World Wars. The First World War Battalion War Diaries of the King's Own Royal Lancaster Regiment are now available from the museum on CD-Rom. 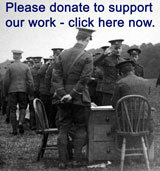 Find out more about the War Diaries. Death certificates for the British war dead are held by the General Register Office, PO Box 2, Southport, Merseyside, PR8 2JD. Telephone: 0300 123 1837.